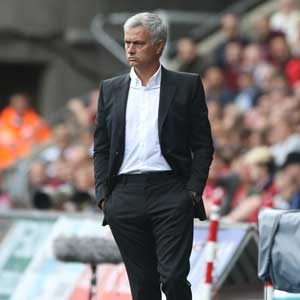 Manchester - Manchester United manager Jose Mourinho will hope to cap a successful week, on and off the field, by making it three wins in as many games when Leicester visit Old Trafford on Saturday. United have won their opening two league games, each by 4-0 scorelines, at home to West Ham and at Swansea, while Mourinho has been boosted by seeing key squad members return from long-term injuries. As if that wasn't encouraging enough for Mourinho, Swedish striker Zlatan Ibrahimovic has rejoined on a one-year contract and should be available before the end of the year after recovering from knee surgery. Defenders Luke Shaw and Marcos Rojo are also regaining fitness, along with winger Ashley Young. Shaw and Young, who both came through an under-23 fixture this week, could find themselves on the bench against Leicester. With Ibrahimovic still months away from a return to first-team action, Mourinho will be hoping Romelu Lukaku, the man signed to replace the 28 goals scored by the Swede last season, can continue in his current form. The Belgian international scored three goals in his first two league games - four in three games, including his goal in the European Super Cup defeat to Real Madrid. And Ibrahimovic believes that, despite losing club captain Wayne Rooney this summer, United's attacking corps is far stronger thanks to the development of Marcus Rashford and the arrival of Lukaku. "Yeah, I'm happy he came. I think the team is much stronger this season, although we lost Rooney, a legend," said Ibrahimovic on ESPN FC. "Signing Lukaku makes us even stronger because he has different qualities from me as a striker and from Rashford as a striker. He is a powerful guy and he brings extra qualities in a game." The addition of Lukaku - plus, presumably, his own pending return to the United fold - has convinced Ibrahimovic that Mourinho's side can win the Premier League title this season. "In the Premier League there are many rivals, which are the top six let's say, they will give a hard time for everybody," he said. "Like last season Chelsea was the best team, they won. You'll still have Chelsea, you have Liverpool, I think Everton are not to be underestimated because they have a great coach and they are investing a lot to win. "And obviously you have Arsenal, Manchester City. So I think it will look like last year but this year the Red Devils will be on top." Leicester head for Old Trafford hoping defender Harry Maguire recovers from a knee injury in time to continue his impressive start to life with the club. The close-season signing from Hull has performed well enough in his two Foxes appearances so far to win a place in Gareth Southgate's latest England squad. But he missed training on Thursday with an injury that could force him out of the United game and England's meetings with Malta and Slovakia. Leicester manager Craig Shakespeare believes the centre-back could be an England captain of the future. "I don't see any reason why he can't," said Shakespeare. "He's very level-headed. It's something that's come along fairly quickly. But he'll take it in his stride. He will take to it like a duck to water. "He has impressed everyone with ability as well as his character. We are delighted for him, he can be really pleased with his overall performance since he has been here. "It's vitally important you bring the right characters in. He is aware of what he needs to do. I am really pleased with him."